When I hear someone talking about their dog like this, I know just what to expect when I visit them. There will be a lot of shouting, in an increasingly stern and abrupt voice. There will be finger-wagging, the owner will bend over the dog and stare at him. And the dog will either fly around getting more and more excited (read “stressed”) or shut down completely and opt out. The owner will think his dog is complying, but this is what’s known as Learned Helplessness - “I can’t do anything about this so I’ll give up”. There will be much frustration all round. This has come about not because the owner is nasty or domineering, but because of how they think they need to act with their dog. Old sins have long shadows! They seem to have got the idea that you have to be firm, authoritarian, dominant - whatever you like to call it - with a dog. While they accept that this is not going to work with people, they blindly accept that this is what you do with dogs. It’s true that dogs - all animals - had a hard time in the past, and still do in many cultures. They were regarded as second-class beings - some people even believe they don’t feel pain as we do. Then what about the astonishing displays of Dancing with Dogs, where the dog learns an extended routine of actions to perform in harmony with its owner? Here’s a superb example. If you see the enthusiasm and joy expressed in that video (do watch it, it's not long and you'll be enchanted), and in the dogs who excel at Agility and Flyball, you’ll realise that this can’t come from being nagged or punished. It’s pure enjoyment, harnessed. Even the police - who used to claim they had to be hard on their dogs to be confident that they’d protect them - are now finding that working with the dog rather than against him is infinitely more successful and rewarding for both dog and officer. We don’t treat children, spouses, or employees like this any more, so why do it to our dogs? There has been so much change in the way we live over the last century. But it seems that animal care and education lag behind the general trend - by a good number of years. Doing things a certain way, unquestioningly, because that’s how our parents did it, is not going to move us forward. That thinking would have kept us in caves! We have to take the learning available to us and implement it in our lives. So we must question what we are told to do. This is one of the valuable aspects of the teenage years - question, reject, question, reject. Of course you have to replace what you’ve rejected with something better! And this would mean being picky about what you watch on television. Just because it’s printed in the paper or broadcast on the screen does not mean it’s right! There are plenty of people making good money from programmes indicating that a sharp, quick, fix is what’s needed to solve all dog behaviour problems. If you still think that beating a child for a minor transgression is ok, then you probably believe this twaddle. But most of the people I work with are good, kind, people, who wouldn’t dream of abusing their children. Yet somehow they have allowed this dissonant belief - that animals are different and need to be abused to be acceptable - to take root in their heads. I recently saw video of one of those tv personality, non-qualified, self-styled “dog trainers” giving a course on teamwork in the workplace. He used his unpleasant practices on their dogs - leaning over them and shouting, sneering, jabbing them, yanking their lead - to demonstrate. I was appalled that the owners were accepting all this! Suppose they were to go back to their office and shout at their staff, belittle them, jab them in the ribs, pull and push them around?! I feel sure this is not something they would countenance - and if they did they’d soon be advertising for more staff! - yet they swallowed all this because this guy had given himself a funny title and been on television. People seem to lose their critical faculties when dealing with their dogs! Dogs are simple souls who try to please. They have fears and anxieties just as we do. They do what works. Your puppy who sits down on the pavement and refuses to move is not being stubborn. If you’re not sure whether you’re heading into a swamp or a quicksand, sitting still and pondering is a good survival tactic. And if you’ve only been on the planet a few weeks, sitting still and waiting for Mum to guide you is also a good move. 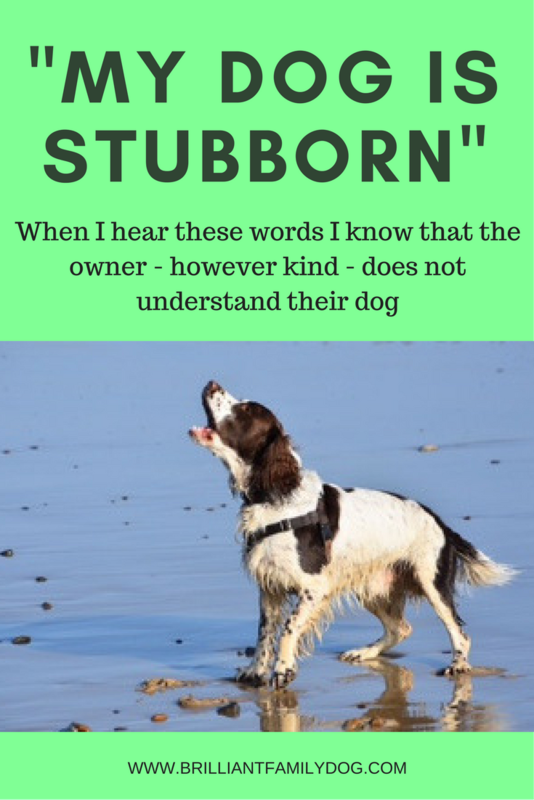 So if you find yourself describing your little puppy as “stubborn”, “obstinate”, “wilful”, and the rest, try substituting the words “fearful”, “anxious”, “eight weeks old” into what you just said and see if that fits better. You’ll surely treat the situation differently once you look at it differently. Working with someone is so much more pleasant - and effective - than imposing your will on them. Giving the dog a choice (heavily loading the odds in your favour!) will get the result you want without all the expenditure of effort involved in shouting, repeating yourself, and trying to sound masterful. Dogs do not arrive with us with a perfect grasp of English, or any understanding of our wavy arm gestures. Before you can expect her to respond to what you’re saying, you need to teach your dog what it is you want. Then you can concentrate on the good things your dog does, and ignore the rest. If you tell a child he’s a cheat and a liar, that’s what he’ll be. Turn your focus to what you do want, rather than what you don’t want. Catch your dog doing something you do like - and be very excited about it! Once I’d understood this, life with my dogs became a breeze. Most things I don’t appreciate are ignored - no point in stressing about something that is over. So if shouting “commands” at your dog is not working, try treating your dog as you would a shy two-year-old, and quietly ask her for what you want. You may be astonished at the response you get! P.S. You’ll have worked it out by now: those three words are “stubborn”, “obey”, and “command”. Banish them from your vocabulary! And that’s normally the case. Just because a dog has an issue with other dogs does not mean she’s a bad dog in every way. You know what a smashing dog she is at home - a Brilliant Family Dog! - and you’d like others to see what you see. Instead of what they see: A fury of teeth, claws, and noise, who looks as though she wants to kill them, their children, and their dog. I know just how you feel, because I’ve been there! And changing the way Lacy views the world has been a fascinating journey that has resulted in being able to help lots of other Lacys and their ragged owners. Lacy is deeply suspicious of everyone and everything on the planet. Her response? To shriek at it to go away; to look her most ferocious; to keep things out of her space by leaping and lunging at them. The most adorable and affectionate (and intelligent) dog at home - with a great sense of humour - she was viewed by everyone else as some kind of deranged monster. But she's come on so much that she is now able to help me working with other reactive and fearful dogs. It will help you to know from the outset that this type of behaviour is normally the result of fear. Not nastiness, aggression, “dominance”, or any of those other labels. Just plain tail-wetting fear. Your dog is afraid of the oncoming dog. She needs to keep it away! So she bares her teeth, makes herself look bigger, and shouts at him. It’s likely that you get upset and try and rein her in or drag her away. It’s likely that the oncoming dog’s owner is alarmed (and probably looking down their nose at you). And it’s quite likely that the other dog will say “Who’re you lookin’ at?” and join the barking party. The whole episode is upsetting and exhausting. You start to walk your dog at the Hour of the Difficult Dog, late in the evening, when everyone is trying to avoid everyone else. Is this why you got a companion dog? Let’s have a look at what you can do to change things. Can you imagine that you had to walk along a narrow and uneven cliff path with a 200 foot drop. There is nothing to hold on to. The ground is crumbly and sometimes you skid and dislodge a lump of rock that bounces down the cliff and splashes silently into the sea below. For most people this would be a living nightmare, a “terror run”. You would be desperate to get out of the situation. Your hormones would be racing through your body. You eventually get home and begin to calm down. The next day you have to walk the path again. Quite soon you’re in a state of permanent panic. You dread the cliff path. You need a break from this terror. Your hormones need to settle so you can see the world clearly. As does your dog. You won’t stop walking your dog for ever. Just give her a few days’ break so that she can get back to normal. You can play great games at home to give her some exercise. As neither of you is enjoying the walk, nobody will miss it. And by this I don’t mean you are sentenced to the Hour of the Difficult Dog for ever. Back to you and your terror run again: rather than staying at home for ever, you have a companion who can guide you. As you approach the cliff path, he turns you away from it and says, “Let’s go this way,” and heads right away from the edge. Can you imagine the relief you feel? No need to plead with him and say, “Please don’t make me go on the path!” He guides you away to safer ground every time he sees a dangerous path. Your trust in him grows. You begin to enjoy your seaside walks. So it is with your dog. The moment you see another dog or person heading your way, you give a cheery “Let’s go!” and head in the opposite direction. Your dog will enjoy the fact that she doesn’t have to get upset and go through the shouting routine. You want to avoid narrow lanes where there’s no escape, so you may have to take a longer route to get where you want to go - or even drive till you are at an open space. But you don’t want to avoid dogs. She won’t learn what you want her to learn unless you do it, so eschew the Hour of the Difficult Dog and go out where you will see dogs - but at a safe distance. These two things alone will make a huge difference to your dog, your walks, your relationship with your dog, and your enjoyment of life with her. If you did nothing else, this will improve the situation dramatically. But this is just a start: naturally there are lots more things you will be able to do! There are techniques which I’ll show you. But the first thing you need to do to a wound is to stop it bleeding. Only then can you start the healing process. First, realise that your dog is afraid, and is as uncomfortable as you are. Reasoning with her will not work. Until you can get help from a force-free professional, avoidance is the short-term answer. Second, remember that you are her guardian and protector - give her the help she needs to cope with our world. No idea how to start?